What did you want for Christmas? Did you get it? Well, in case someone out there is looking for a gift for me, here is a suggestion! You don't have to actually buy it for me; almost as good would be a hint where I could buy it. It is a set DS # 27, "im Schrank". 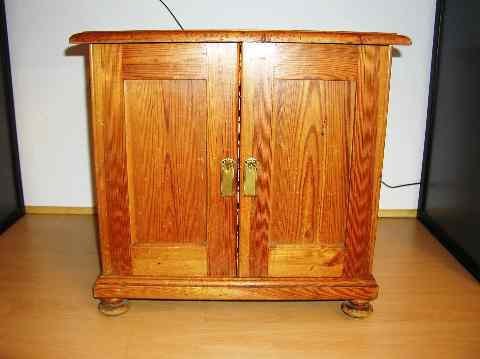 "Im Schrank" means "in a chest". The Richter factory offered this deluxe packing for a few of the large sets. The most common, which is not all that common, is set GK-NF # 34, Lyck. I have one! :-)) And I have a few sets in modern chests. But this DS 27 is obviously original Richter -- from 1912 through 1914. See the builder's page for more pictures of this fabulous set. Jerry Slocum has written The Anchor Puzzle Book. It is a very important book on Anker -- not just the puzzles, but also F. Ad. Richter & Cie. The carefully researched history of the Anker puzzles also adds to our knowledge of Anker Stone Building Sets. Buy the book; you will not be disappointed. Reserve a book for delivery at either the Anker Treffen in Rudolstadt on September 22nd or the CVA meeting in Hilversum on October 20th. The Anker Treffen was held in Rudolstadt onSaturday, September 22, 2012, at the Anker factory in Rudolstadt, Germany. The next CVA meeting: Saturday, April 6, 2013. The location is still undecided. I plan to be there. For the month of January, 2013.